Our first competition of the year saw us converge on a Sunny Glorious Hockley, a huge thanks to Ann Younger for pulling out the stops to get us a great venue after our original choice, like so many other courses, was under water. 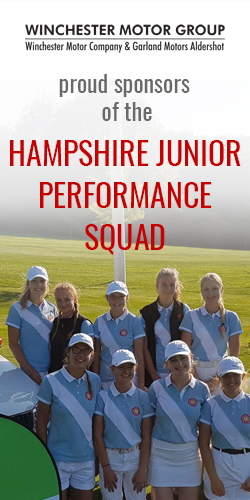 The girls were sent out in their respective groups and sure enough good golf was soon to follow, not only by our more experienced girls but also some of the new youngsters playing in a Hampshire Girls comp for the first time. The scoring was very good and very competitive with 5 or 6 girls being tightly bunched coming down the stretch. Our eventual winner was Brooke MacArthur from Stoneham scoring a great 39 points, ensuring a nice cut in the process. Hannah Hellyer 38pts (Hayling) and Emily Curwood 36 pts (Rowlands Castle)were 2nd and 3rd respectively. Beth Goater from Hockley tidied up the prizes with best scratch score. After the wonderful Hockley staff served the girls their after match meal, it was time for presentations. The prizes were presented by President Jackie Kaye and our past CJO Elke Jackson. Special thanks to Hockley ladies’ captain June Glasspell who enjoyed starting everyone.